Emojipedia notes that with Twitter's adoption of David Bowie-like figures for its singer emojis, the British pop legend lives on as such on four major platforms: Apple, Google, Microsoft and Twitter. The only other easily-identified star is Prince, as used by WhatsApp. 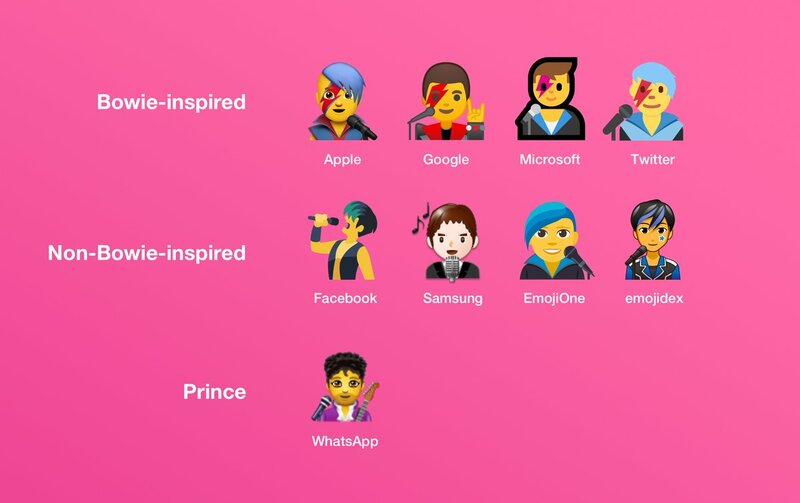 Bowie- and Prince-inspired characters are used for both man and woman singer emojis. Facebook, Samsung and others use generic (or at least less identifiable) characters, because they are boring. The Gourmand magazine commissioned Matthieu Lavanchy to create some of the most popular food emojis from the real thing. The whole project feels a bit like a modern update of Magritte’s The Treachery of Images.